I’d like to share with you a pretty typical conversation that ensues each time I break out something new that I’ve made for myself. Me: What do you think of my new coat? (pre-empting some inevitable design confusion) It’s a drop shoulder design. It’s supposed to be unfitted. Husband: It’s interesting. I like it. (moving closer to inspect my stitching and style lines better) It’s really good. But it’s a bit big for you. Look at the shoulders. Me: It’s the design. That’s why they’re called drop shoulders. Husband: It’s a bit big at the back too. It looks a bit masculine. Me: Yeeeeeesss (my speech slows and perhaps my eyes begin to roll a little). It’s the design. It’s a boxy, oversize, drop shoulder style of coat. Husband: You know, it would look great if you cinched in the waist with a really wide belt. If you follow me on Instagram, you’ve already seen the original coat that caught my eye and that ended up becoming my design inspiration. I also shared a few sketches of my own coat in the early planning stages. I’m pretty useless at drawing, but Fashionary is a great way for me to get my ideas down on paper, so that I can solidify a design in my head, and then have something to refer back to when I’m playing around with the actual pattern pieces. The cowhide I used, as you know, was upcycled from my leather skirt. 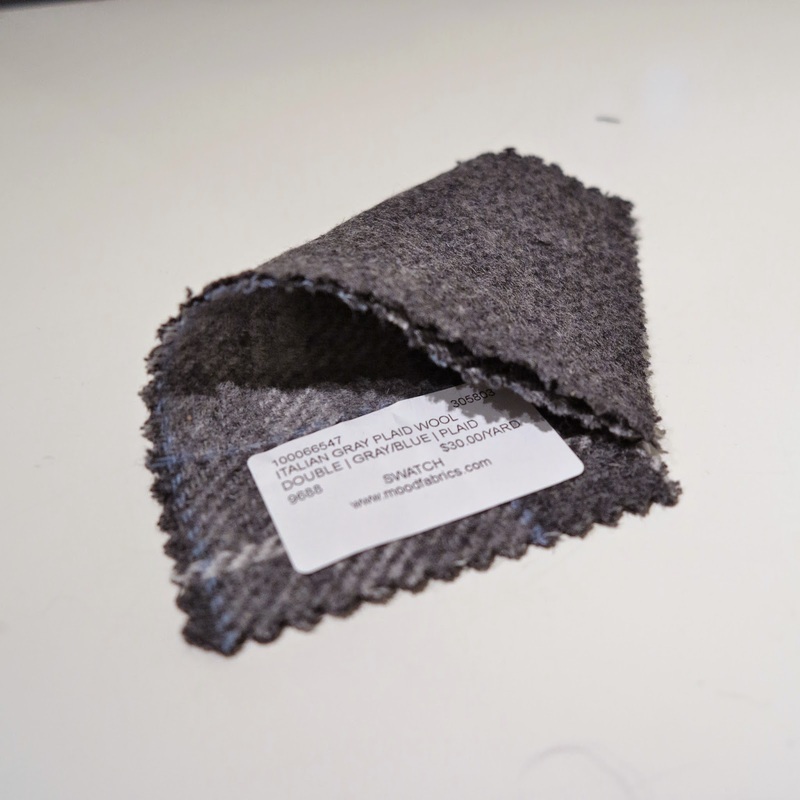 The grey fabric is a beautiful, medium/heavyweight, double faced wool. One side is grey and the other is a pretty plaid. Both sides are invisibly stitched together very securely. The edge of the swatch in my photo is separated because I actively removed the stitches to pull both fabrics apart. Even though I didn’t make the most of both sides of this great fabric, I still found it useful in reducing the bulk in my coat. I only used one layer of the wool fabric for the collar underside since the leather was so bulky. 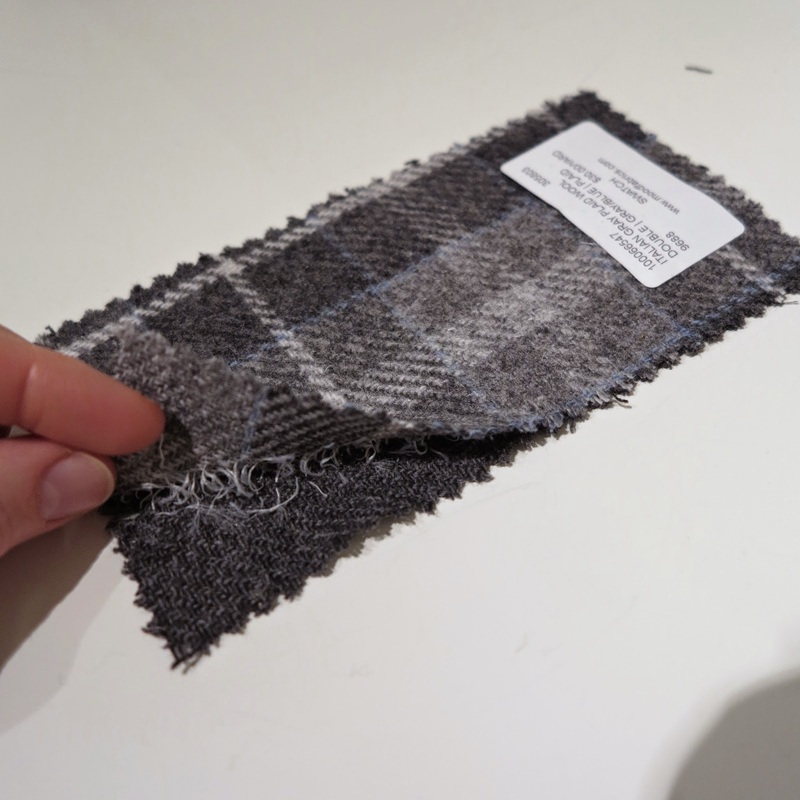 I also carefully separated and cut away the grey seam allowance when preparing the facing to attach to the bulky leather at the front of the coat. 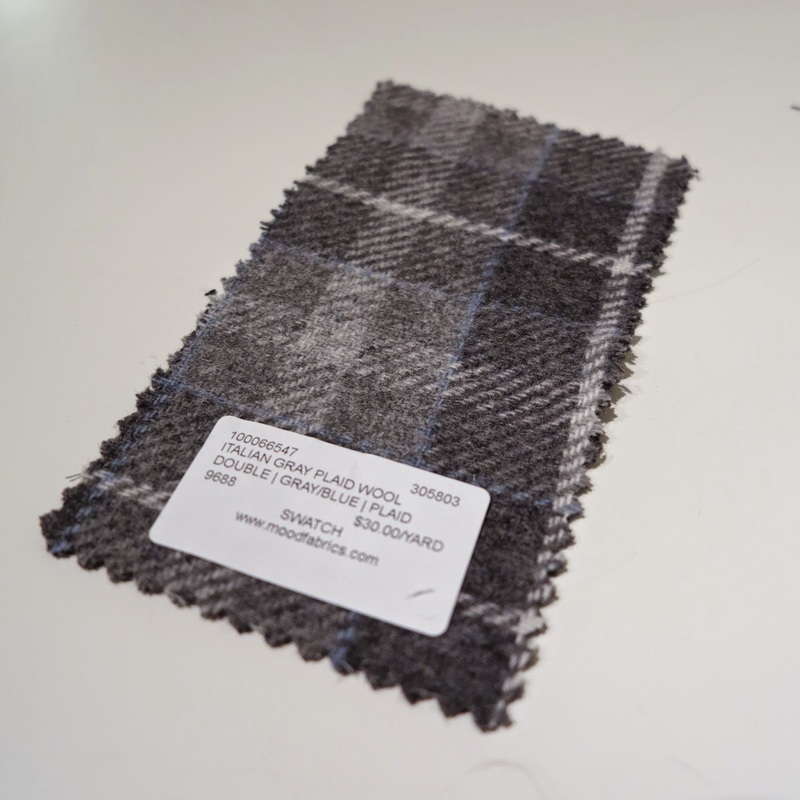 I preferred the plain grey for the outer of this particular coat and I only used the plaid for the front facing, but if I had a limitless budget, I would definitely buy more of this great double faced wool and make it up quite simply and unmodified in and unlined coat like Vogue 8930. In terms of construction, I underlined both the front and back leather yokes with hair canvas. The lining I used for my coat was a sleek Ralph Lauren polka dot silk CDC. I also used a bit of blue lambskin for the contrast panels and pocket welts. I am so pleased with how this coat turned out. It isn’t perfect. I had a lot of trouble top-stitching through the thickness of the cowhide in many places. However, with a little handstitching and compromise, I don’t think that this is too noticeable. I also haven’t decided on front closures. I quite like the clean, no-closure look. I could have used magnets, but the coat keeps closed well enough on it’s own because of it’s roomy nature. I’m also considering buttonholes, via an embroidery house or by hand. I love my Pfaff, but I think coat buttonholes need a bit of extra special treatment to look professional. I’ve also thought about leather buckle/toggles, but I’m quite happy with the coat as it is right now. This entry was posted in Butterick 6900, coat, crepe de chine, jacket, leather, Mood, Ralph Lauren, refashioning, silk, Tandy, upcycling, wool on January 20, 2015 by Debbie Iles. The change I made to these pants is so simple and straight forward that it hardly deserves it’s own post. However, it is interesting to see how such a small change can be so effective in updating a style. I made this pair of leather jogging pants almost a year ago now. My original post about them is here. They were my first leather project and I was out pretty happy with how they turned out. In fact, they’ve come in handy a lot. I find that leather items fill that blind spot in the wardrobe, somewhere between dressy and casual. Cropped, elastic cuff pants have also been quite fashionable over the past year, but I’m pretty tired of that particular look right now. I’ve also secretly always yearned for these pants to be a little longer. It didn’t take much to fix. All I did was to carefully cut off the cuffs and add hem panels of about 10″ on both legs. Because there are so many other panels stitched throughout the pants, it doesn’t look out of place. Now they are long enough to wear with high heel booties, or with flat sneakers if I fold the hem up as I’ve done in these photos. This entry was posted in cotton, jersey, leather, Mood, pants, Sew DIY pattern, Tandy, top on December 7, 2014 by Debbie Iles. I liked my last version of Simplicity 1366 so much that I made another. This time I wanted a snuggly, casual top to wear to the gym or throw on with jeans. I kept the shape the same as the last time when I made it up in white denim. I just added a wide, slightly stand-up neckband and shortened the sleeves a smidgen. The fabric is a soft, fleece-lined, semi-stable knit. 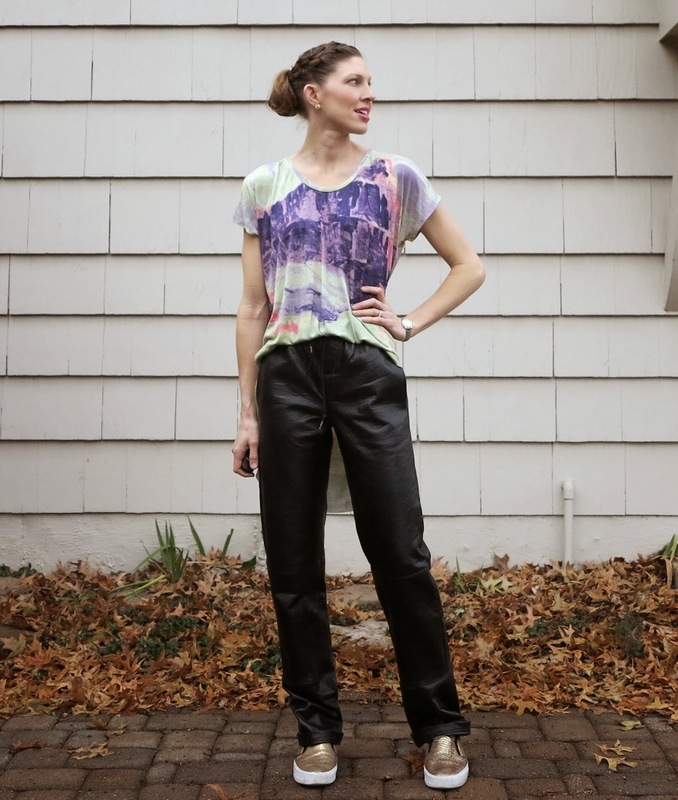 My leather shorts were blogged about several months ago. They’ve been a surprisingly favourite make for me. Knowing how hot leather is, I wasn’t sure how much I’d actually want to wear them in a sweltering Kansas Summer. They are loose enough to be cool on my legs and they go with so many different styles of tops. They’ve actually filled the blind spot in my wardrobe that sits somewhere between too dressy, and not dressy enough. Elastic waist shorts and a T-shirt for smart casual, yes! 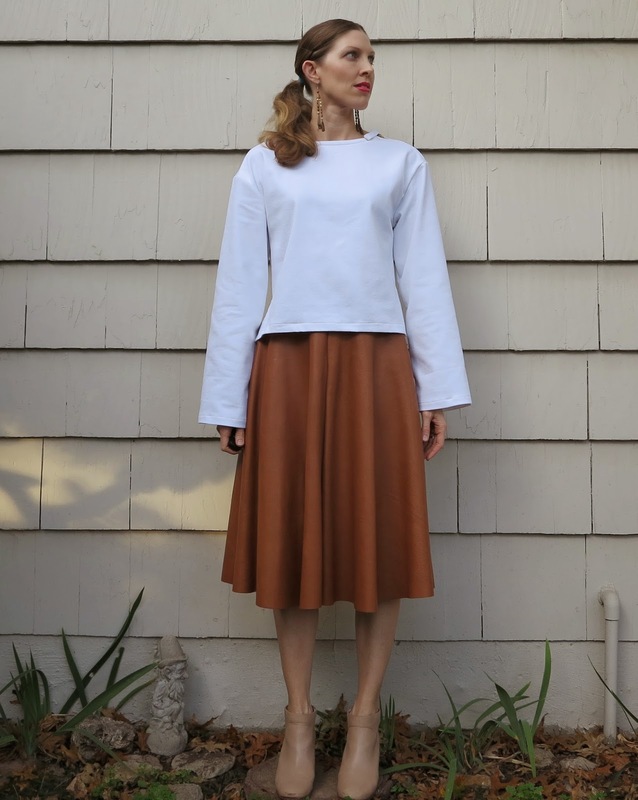 This entry was posted in cotton, leather, shorts, Simplicity 1366, Tandy, white on November 11, 2014 by Debbie Iles. I just can’t stop with this Cynthia Rowley pattern, Simplicity 1366. It is seriously the most perfect blank canvas. My other makes of this pattern are here, here, here, and here. lengthened the arms to extra, extra long. I wanted to roll these sleeves up. lengthened the back bodice piece but kept the front piece short. I added extensions to the bottom of each side seam so I could hem little slits in each side. Here is the top photographed untucked and with the sleeves left long to help you get a better visual of the modifications I made and how these relate to the top’s actual shape. I won’t be wearing it this way in real life, but I needed the length in those arms to create the bulky, rolled up look you see in the earlier photos. I paired the top with my favourite leather skirt. 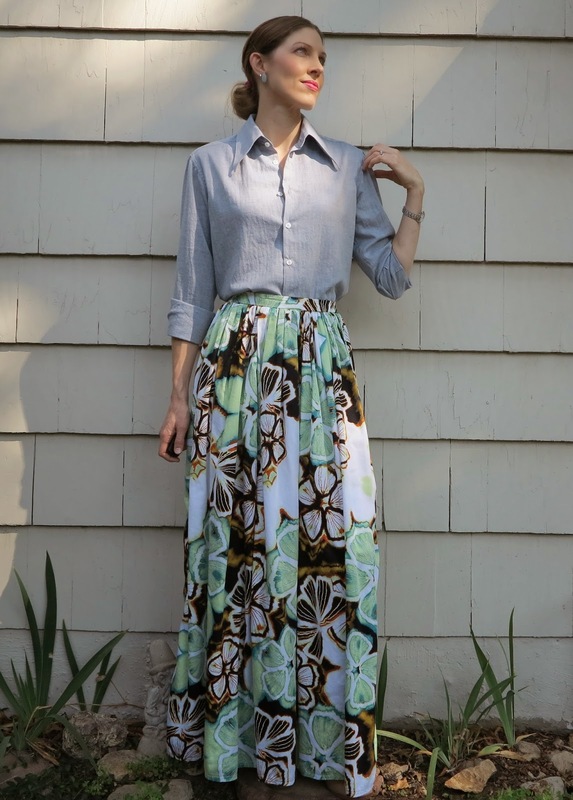 This entry was posted in denim, Fabric.com, leather, refashioning, self-drafted, Simplicity 1366, skirt, Tandy, white on October 28, 2014 by Debbie Iles. I’ve made more than my fair share of kimono style jackets this year (here, here, and here). The style is just so versatile, especially at this time of year when I’m trying to prolong the wear of my Summer gear by layering them upon everything. Once again I used B5409 and modified it in the same way as earlier versions. My butterfly silk CDC lived an earlier life as a floaty maxi dress. It was lovely. I loved it, but then I moved on, and there was just too much beautiful fabric in that dress to lay dormant in my cupboard. This time round, I used goose biot feathers to fringe the kimono for a fancy, ‘festival’ look. Google defines fringed kimonos as festival. Who am I to argue with Google. I’ve paired it with my leather shorts and floral bustier for the photos. And if I was headed into Summer, I might have even taken this outfit out for a spin. In real life, we are headed into cooler days, so I want this kimono jacket to wear over my matching, Chanel-inspired dress and pants. I’ll be unpicking those glorious feathers because I don’t think they will fare so well on the school run. But you know me. I’ll use them again for something else. This entry was posted in B5409, bustier, cotton, crepe de chine, Gorgeous Fabrics, Jo-Ann, kimono, leather, self-drafted, silk, Tandy, top on October 13, 2014 by Debbie Iles. I’d originally intended to sew this shirt up as an Archer. I even purchased the pattern (the PDF version because that’s all there was TWO weeks ago). The problem is that we don’t have a printer at home. Like a land-line phone, it’s one of those things we haven’t really felt an urgency to purchase since setting up from scratch over here. Hubby was going to get it printed for me, but then he balked at the 60 pages and promptly left for a week long business trip. Honestly, it wasn’t me! I had my gloriously soft Anna Sui chambray on standby and it was giving me the eye so I was forced to come up with some alternate arrangements. 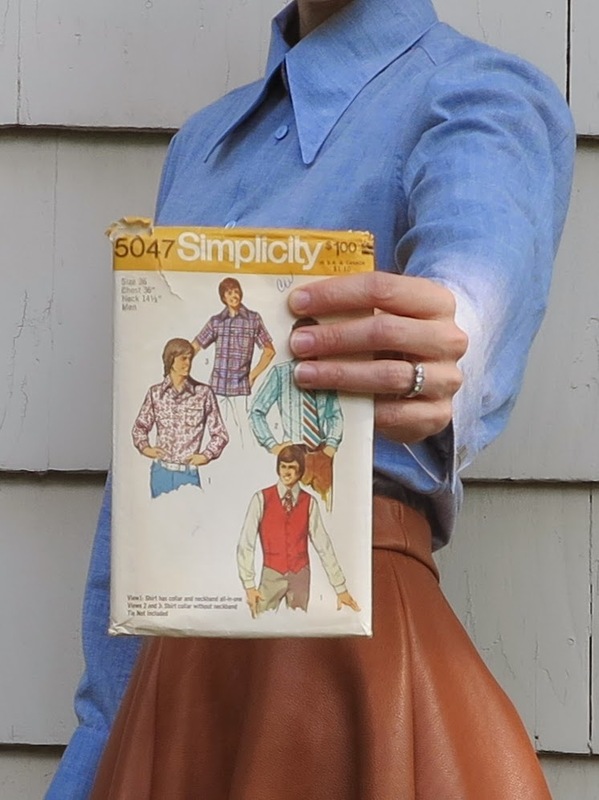 Introducing Simplicity 5047, a vintage men’s shirt pattern that I picked up for a 25c steal at a recent garage sale. The pattern is for a 36″ chest. My bust measurement is 35″, but without much bust to speak of. I also have quite broad shoulders, so my logic told me that perhaps a small men’s shirt pattern would be more likely to fit, where other’s have failed before. I was right! I am so happy with the fit. The shoulders are wide enough. No broad back adjustment was necessary. I wasn’t aiming for a slim fit, but I didn’t want it to be too boxy or roomy through the torso either. It feels just right. I didn’t have to add fish eye darts in the back like I thought I would. The arm length works, but next time I will lengthen them a smidgen. I figured the arms would be longer than usual to cater for long, man arms. As it turns out, my alien arms are a little longer than that of mankind. The only change I made to the pattern was to flick one side of the cuff placket around so that I could have French cuffs instead of regular. 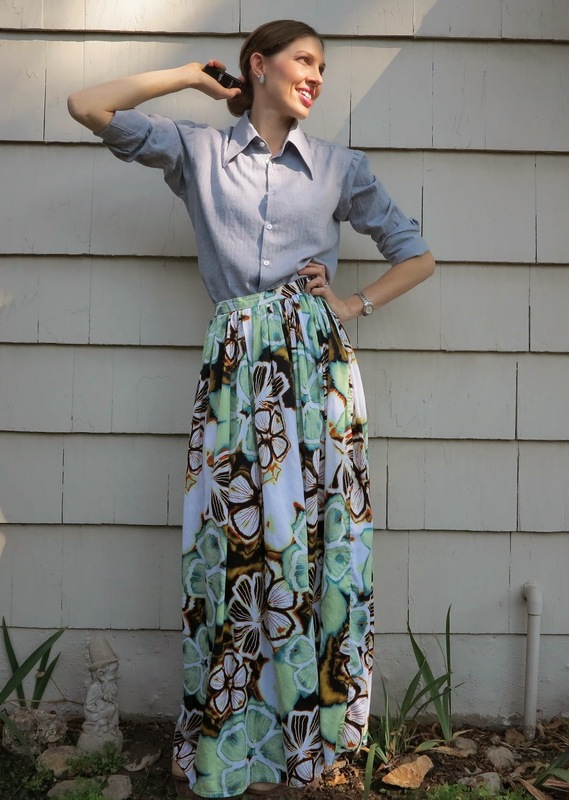 I like the look of chambray paired with my leather circle skirt. But when I was looking at the photos, I realised for the first time that a little peep had been drawing on my leg. Leg is clearly a far more creative medium than paper. I like that she matched my skirt though. The best thing about this pattern is the collar. In fact, if I’m perfectly honest, it was the collar that swayed me more towards getting started on the vintage pattern instead of waiting for my Archer. But unfortunately it is another one of those all in one collar band and collars. It works well enough, but I just feel that it isn’t the proper way of doing things.The neck width feels great though. I love it done up to the top button. But it also works well undone and paired with my favourite maxi skirt. I love the fit of this shirt, but there are a few construction details that I will change next time I sew this pattern. There is no proper front button placket. It’s more of a self-facing that is folded inwards, but not stitched down. Next time I will add a proper front placket as well as a collar band for a more professional finish. I will also shave a bit off the sleeve cap. There was a ridiculous amount of unnecessary ease in those sleeve caps. It’s so nice to sew a shirt that fits well right off the bat. I’ve always had trouble finding RTW shirts that fit, due to my long arms and broad shoulders (comparatively speaking to other females). Perhaps I should have been looking in the menswear section instead! This entry was posted in chambray, cotton, leather, maxi, men's shirt, Mood, shirt, shirting, Simplicity 5047, skirt, Tandy, vintage patterns on October 1, 2014 by Debbie Iles.